Log into your Facebook business page and head over to the right on the top menu bar. Choose Settings. On the left hand side, 3 down, you will see Edit Page – click on this. In this section Facebook allows you to choose a Template for your business page. There is the Standard template plus seven others to choose from. The buttons are the across the top. Like, Follow and Share plus the three dots allowing you to access more options are included in seven of the eight templates and can’t be changed. The Not for Profit template has Like, Follow and Send a Message as a default. Some templates have an additional option for their Primary Button on the right hand side. Need Help with your Business Facebook Page? The tabs are on the left hand side. There are four additional tabs which some templates get and others don’t. The order of the tabs changes depending on the template chosen. For example the 2nd tab on the Venues Template is Events, whereas for many of the others it is further down the list. Only the Politicians get a Notes tab and only Services gets a Service tab. 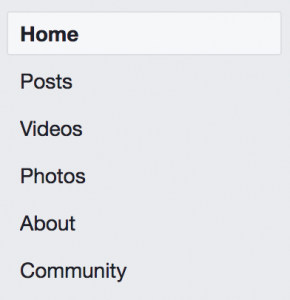 After all that if you don’t like what Facebook has chosen by way of Tabs for your page, you can turn off the Default Tabs and choose your own!